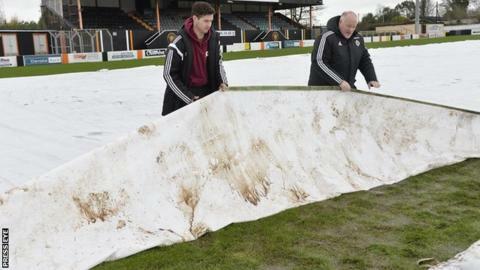 The Irish Premiership game between Carrick Rangers and Glenavon on Friday has been postponed because of a waterlogged pitch. The decision to call off the league match was made following an inspection on Friday morning. It is the sixth postponement this season at the Belfast Loughshore Arena, Carrick's home ground. A new date for the match has yet to be arranged as a fixtures backlog continues to lengthen for Rangers. The remaining five Premiership games go ahead as scheduled on Friday afternoon. Read more on Which of these dream boxing matches will come true in 2016?